This designer sale is ending soon and it’s the best time to get your favorite pieces at a great price. I love the sales at Shopbop, as they carry a lot of rising designers and have so many unique styles and pieces. Among the designers, Aviva Vira is a brand that I am totally in love with. 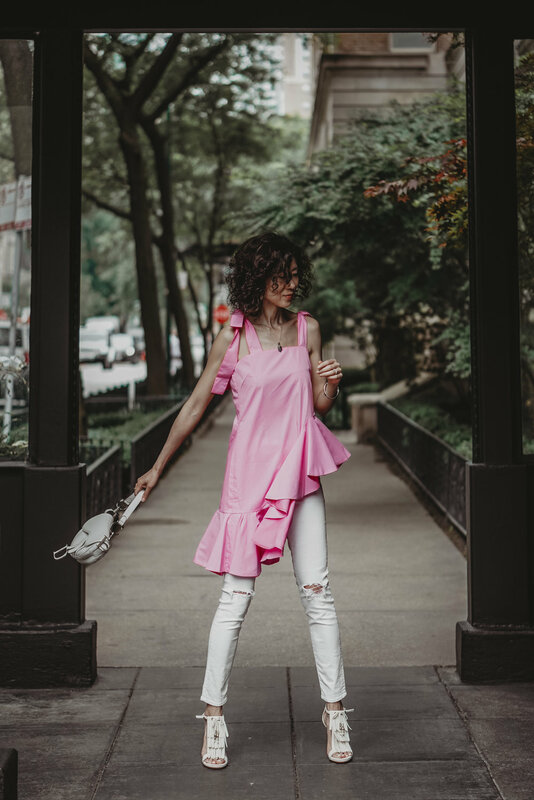 If you are looking for a summer top that is so different and has unexpected details, this pink poplin flower bomb ball gown top is absolutely the right one. The cool asymmetrical structure and ultra-romantic shade of pink give this top an eye-catching feminine charm. I styled it with a pair of white distressed jeans to tone down the look. My very old pair of Gucci heels and Dior Saddle bag elevate the whole look. At the price of 70% off, you definitely will be happy to get this statement top for your wardrobe.